It’s a tricky thing taking a historical figure and inserting him into a work of fiction. It’s even more complicated when he is a hero like Martin Luther King, Jr. Katori Hall, the playwright, not only takes on the challenge of presenting historical fiction – but she adds a fantasy element that takes it way over the top. And yet, it seems to work. I credit the strong performances by Gavin Lawrence and Torie Wiggins. Lawrence, a Washington DC based actor, brings Dr. King to life and doesn’t shy away from making him flawed and complicated. Wiggins, Cincinnati’s busiest – and perhaps best – actress was stunning in her portrayal of Camae, a fictional motel maid who spends an infamous evening (the night before Dr. King’s assassination) befriending him and then turning his whole world upside down. To say more about the story would be a disservice to the script and your experience – because you absolutely should go see this show. I will say that if Torie Wiggins decides to become a preacher, I’ll attend her church for her sermons alone. Some really amazing work by her here and I was already a huge fan. We are fortunate to have her in town. D. Lynn Myers direction is pitch perfect, calling for just the right amount of technical elements without overwhelming the story. The tech, by the way, is very very good even though the show doesn’t even need it. But I’m glad Ensemble pulled out all the stops. The set design (duh, its Brian Mehring) is impeccable and the attention to detail is flawless. It really feels like a 1960s hotel room from the drapes to the colors to the wood paneling to the air conditioner. I was moved by the show and I think that if you have any connection to the legacy of Dr. King and his work to change the world into a better place for all of us then you, too, will leave the theater feeling hopeful that indeed the baton has been passed. . .to all of us. 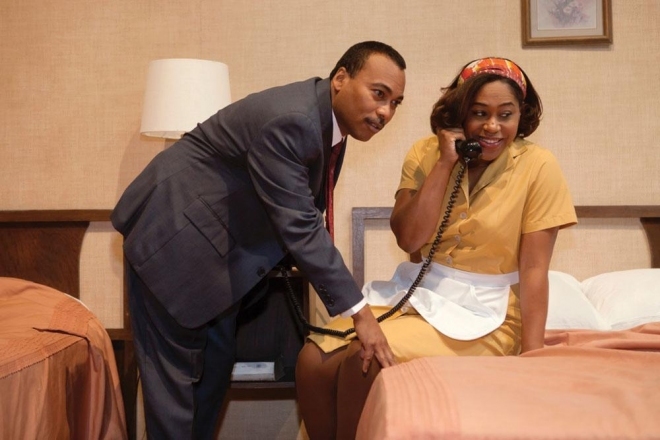 THE MOUNTAINTOP runs through April 6th at Ensemble Theatre of Cincinnati in Over-The-Rhine. Tickets are available here.